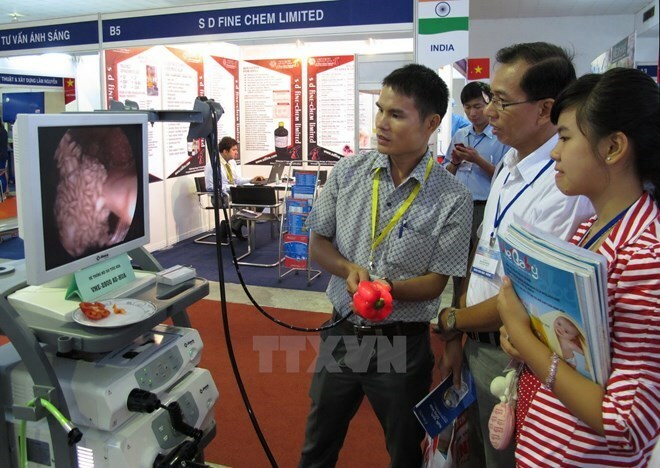 HCM City (VNA) – Latest medical and laboratory equipment, healthcare products, food supplements, cosmetics and pharmaceutical packaging machines are on display at an exhibition, which opened at Sai Gon Exhibition and Conferences Centre, Ho Chi Minh City on August 17. The Vietnam Medi-Pharm Expo 2017 exhibition drew the participation of 250 businesses showcasing their products at 350 booths. Those include giant corporations and leading global companies from 22 countries and territories such as the US, Germany, Ukraine, Belarus, Russia, Uzbekistan, Iran, Turkey, the Republic of Korea, Japan, Malaysia and Thailand. Along with trading activities among the enterprises, the three-day exhibition will also feature seminars “Introduction to Vietnam’s Pharmacy and Medicine Market” and “Local Medical Pharmacy Market and Policies”. Besides, the event covers a fact-finding tour to Cho Ray Hospital, a large hospital in HCM City, so that they can get an overview of the medical examination and treatment demands from local residents. Vietnam Medi-Pharm Expo is an annual event taking place in Ho Chi Minh City in August and Hanoi in December. The expo is designed to promote trade activities in pharmacy and medical equipment. The exhibition is a platform for advanced medical technologies and equipment companies from around the world to access local pharmacy companies, in which Vietnam has advantage to initiate exchanges.